I’m soooo loving this project!! I’ve been wanting to get rid of the microwave and install a hood fan for a while. I’ve always loved the Gourmet Hood Fans but they are pricey and I don’t have the space. Steam would collect on the microwave and drip into food I was cooking. *GROSS! I guess my fan in the microwave wasn’t doing it’s job. The door of the microwave gets opened and closed so much, even while I’m cooking….so, what’s DROPPING into my pots? I don’t even want to think about that! I knew I could sell the old microwave and almost cover the cost. We have a space by the pantry that gets low traffic and has enough room for the new little microwave to get built into the wall – post coming soon. Because I wanted to and The Husband loves me! See the baby microwave in the corner, it won’t be there long, yeehaw! 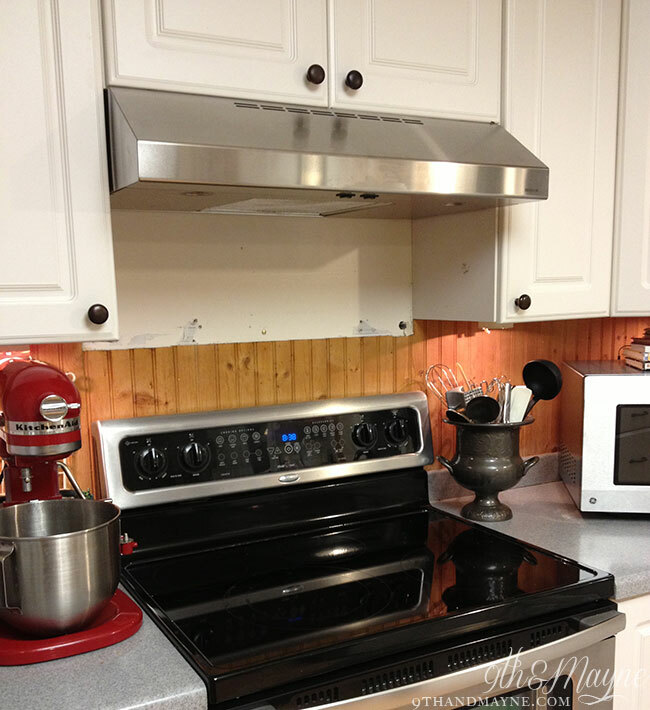 Now, what to do about the backsplash……..
What do you think? Chalkboard, Tile, Tin? What say you? p.s. I can’t wait to show you my kitchen when it’s done….it’s getting there! Can you remove that white metal to reveal the bead board? If so you could paint it all white? Or the tin I used on my back splash isn’t that fake stuff at Home Depot, it’s from Home depot and it’s real tin-you have to special order it. The sheets come in about that size where it could go over the white and end behind your stove level with the counter. I think it would actually fit perfectly. You should check out the samples they have at Home Depot. Plus there’s no fire hazard w/ real tin. Just ask the pro desk where the REAL tin back splash samples are. They even have white. I just painted over my copper one, but copper was really cool. I know they have silver too. You’re so sweet to feature me…Thank you so much!! Love your blog!! I agree…I think it would look great with the beadboard painted out and a platter/plate/tray/pierce of art hung over the stove….and inexpensive too. Cute blog! Great idea! I hadn’t thought of using a piece of art for my backsplash…I’m thinking now! :) Thanks for stopping by! Thanks so much for using my chalkboard backsplash as an example! I can’t wait to see what you do. 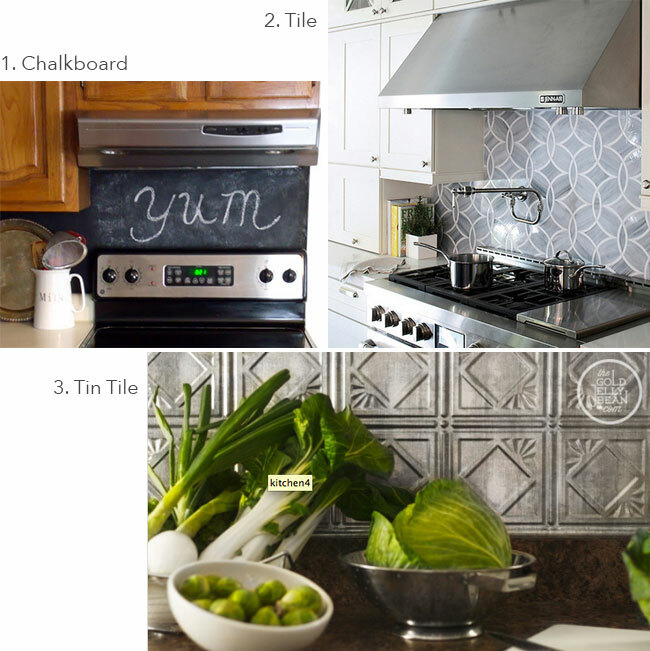 Thank you for stopping by…I love your chalkboard backsplash! I’m still deciding about what I’m doing for mine. I’m an over-thinker! Hopefully I’ll have something soon.